Two newborn baby boys have come to Philomena House, much to the delight of their mothers and all our board and staff members. Our work has now begun. Born on June 29, 2014, little dark-haired Nabeel came to us at 5 pounds, 13 ounces. He made his home here with his mother. Nabeel fixes his eyes on her face whenever she holds him, which is all the time. Our first baby! 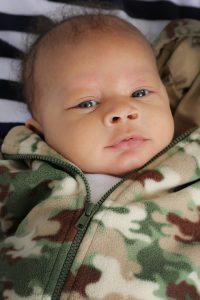 Then on July 29, our second baby boy came, little Kingston, weighing 6 pounds, 14 ounces. He’s now here at Philomena House with his mother. Everyone wants to hold both guys. We thank you for the support you gave that helped bring these little boys safely into our arms. Please continue. Right now, we house four guest residents, our optimal capacity, and have begun our educational program, intended to get them ready for independent living. A host of volunteers have come to training sessions over the last two months to acquaint themselves with the operations of our home and our program, so they can help. We are amazed at the talent and the unselfishness of these wonderful people. More than one hundred people attended our afternoon Open House on Sunday, May 25, a feast of Saint Philomena. The lively crowd included local police and several clergy who came “to see,” and to enjoy cake and punch. 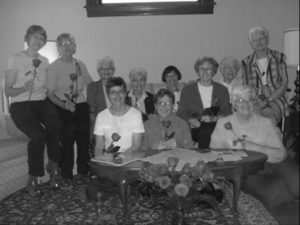 Fourteen Sisters of Saint Francis of Little Falls, Minnesota arrived. Their group had lived in the large Victorian home, until recently their convent. Then our benefactor bought it from them and renovated it for us. They were astonished at the renovation, especially the kitchen, and the beautiful donated furnishings. 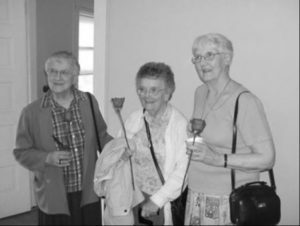 Geralyn, our founder and board chairman, gave them each a rose. Their photos appear in this letter. Volunteers have also fully furnished Philomena House with donated, nearly new, clean and attractive upholstery, lamps, tables, chairs and pictures for the walls. All of it matches! Housemother Sharon King pulled it together, making the home look professionally done. She has also planted a garden now full of fresh vegetables and varieties of lettuce. •	Yard Sale in Saint Paul. Board member, Mary Henseler, held a “first class” yard sale in July. The sale netted $2,200. •	“All That Jazz” Dance Party was staged by St. Gabriel the Archangel Catholic Church, Hopkins, Minnesota. Friday, August 15, 2014. All proceeds went to Philomena House. •	We want to buy or rent a van to serve all the local travel needs of Philomena House residents. To start funding that project, we have sent a proposal to “Open Your Heart to the Hungry and Homeless” foundation. If you would like to hold a fundraising event for us, let us know. We’ve elected three board members. All are already highly active in these very busy, early stages of Philomena House development. Mary Hensel: Mary and her husband moved to Minnesota from Wisconsin in 2003. They have four children. Mary runs her own business making and selling religious jewelry. It was Mary who happened upon the St. Philomena relic and gave it to Bernie at a Deanery meeting. Mary has her degree in fine arts and possesses great organizational skills. She believes Philomena House gives women a real choice. On Friday, June 27, 2014, the Feast of the Sacred Heart of Jesus, Father James Wolnik, Philomena House board member, came to dedicate our house to the Sacred Heart of Jesus. Several board members were present. We await more blessings from God and thank Father for his devotion to our efforts. Many of our friends who came on Open House Sunday on May 25, and some later, left us donations of cash and furnishings. We thank you. And we apologize that in all of the activity, we may have forgotten to give you a tax receipt, which entitles you to a tax deduction from the IRS. If we have left you out, we didn’t intend to, so if you want a receipt, please call and ask us for one and we’ll send it to you. Call Joyce at 651-488-9652. For more information, see www.irs.org. Please continue to remember us in your charity! 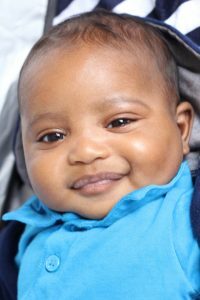 Your generosity has helped make a home for two newborn baby boys, who otherwise might not have made it into this world. We could not have anticipated the joy they have brought us. Nor the sight of the love of their brave mothers. After five years of hard work, we have seen God’s overflowing providence in so many unexpected ways. We ask for your continued support. Remember, Philomena House is a 501 (c) (3) nonprofit organization, so your contributions are tax-free. Please use the enclosed, self-addressed envelope. P.S. We keep you in our prayers. And we ask you to pray for us as well. ⟵Two Newborn Baby Boys Have Come To Philomena House!